Thanks to a co-worker at the jail, I now have a new logo heading the top of my blog. It incorporates a lot of the themes of the blog into this new logo. 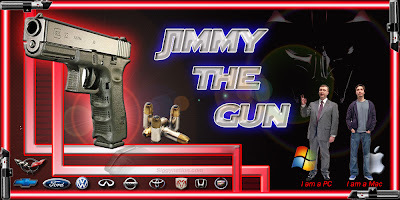 Of course, there's Star Wars, tech, cars, and the traditional Jimmy the Gun Glock 22. If you are interested in a logo like mine, personalized to your site, log on on siggynation.com. Eventually I'll try to get his contact info so you can request him specifically.